Since 1981, Winnipeggers have taken to the streets in June for an annual Walk for Peace. In those early years, the motive was fear of nuclear annihilation and thousands participated in these yearly events. In recent years, the size of the annual walk has been much smaller, but arguably the world situation has become as dangerous as it was in the 1980s. We walked then, as we walk now, to tell our government to become a constructive force for international peace and cooperation. While we cannot hope to sway the decisions of foreign military powers, we can, and must seek to influence our own government. Common wisdom has it that Canada is a peacemaker and that it is too small to have much of an impact on the world stage. Common wisdom is wrong. Our involvement in wars and military alliances are not the actions of peacemakers; our membership in the G7 (along with France, Germany, Italy, Japan, the United Kingdom and the United States) is evidence of our ability to influence international events. Canadian foreign policy is closely aligned with that of the United States, which has a long record of trampling on the democratic aspirations of countries the US seeks to dominate. Canada played a key role in ousting Haiti’s democratically elected president, Jean-Bertrand Aristide, in 2004. Canada joined with the United States in supporting a right-wing military coup in Honduras in 2009. More recently, Canada has joined the US is applying sanctions against leading members of the democratically elected government of Venezuela. Canada’s membership in the North Atlantic Treaty Organization has placed us directly on the path to war with Russia. Since the collapse of the Soviet Union in 1990, NATO has gradually encircled Russia, with Albania, Croatia, Czech Republic, Estonia, Hungary, Poland, Romania, Slovakia and Slovenia joining in recent years. Ukraine, Georgia, Macedonia, Bosnia and Herzegovina have applied for membership. Not surprisingly, Russia views its growing encirclement with alarm and Canada’s actions have added to international tensions. For example, there is Canadian support for Ukraine. Canada’s support for the right-wing forces that violently seized power in Ukraine dates to the bloody days of the 2014 uprising when Canada’s embassy in Kyiv was used as a haven by anti-government protesters. Since 2015, Canadian troops have been providing military training to Ukrainian troops and Canadian politicians have made increasingly bellicose statements against Russia. While our governments (Liberal and Conservative) have behaved badly, most Canadians want to live in a peaceful world. For example, polling conducted by Environics in 2008 indicated that almost 90 percent of Canadians support the abolition of nuclear weapons. Research reported by Environics in 2018 shows that Canadian opposition to nuclear weapons remains high. Despite this, the federal government has refused to support the UN Treaty on the Prohibition of Nuclear Weapons, approved by 122 countries at the United Nations on July 7, 2017. 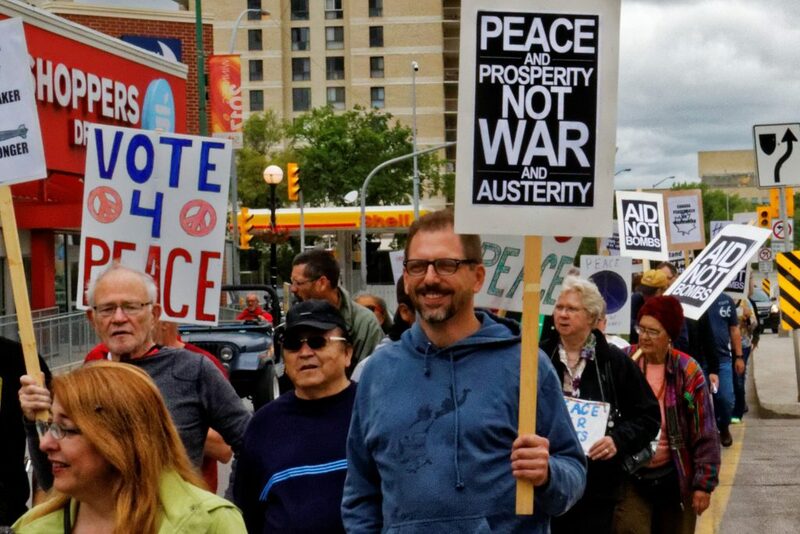 The annual Winnipeg Walk for Peace is just one of the activities of Peace Alliance Winnipeg. We hope you join with us in this event. As well, throughout the year we hold educational events and partner with other organizations to promote international peace and cooperation. We encourage you to join us. Simply visit http://www.peacealliancewinnipeg.ca/join/ and follow the instructions. Or find us on Facebook at https://www.facebook.com/PeaceAllianceWinnipeg.